I think my spirit animal might be an octopus. While raising two kids, I have been working two careers from home simultaneously. Our family has dual nationality and two religions. To unwind from a life of multitasking, I swim in the ocean or a lap pool. If only I had six more arms! The Soul of an Octopus by Sy Montgomery is more than a natural history book; it's also a philosophical reflection on non-human intelligence, a glimpse behind the scenes at the New England Aquarium and a rally for ocean conservation. The writing is engaging and emotionally moving, narrative nonfiction at its best. Octopuses (not octopi, because it's a Greek word imported to Latin, explains the author) have three hearts, a complex brain and even more neurons in their arms. They taste, feel and see the world through their suckers and those arms may have distinct temperaments. Their intelligence and self awareness rivals that of advanced vertebrates like primates and dogs. They camouflage by changing skin texture as well as color and have various strategies for different predators and prey. 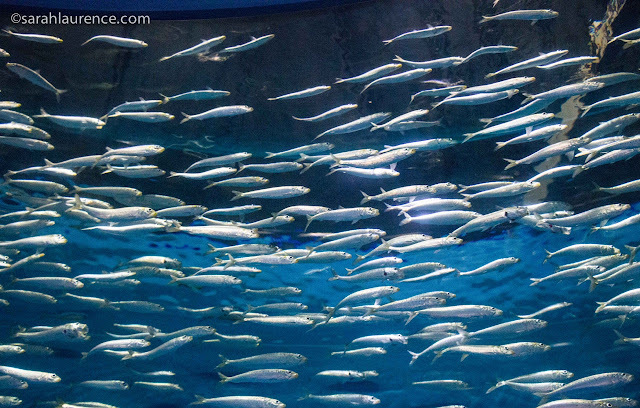 In captivity they continually try to escape, but aquariums keep them as compelling ambassadors for the wild. 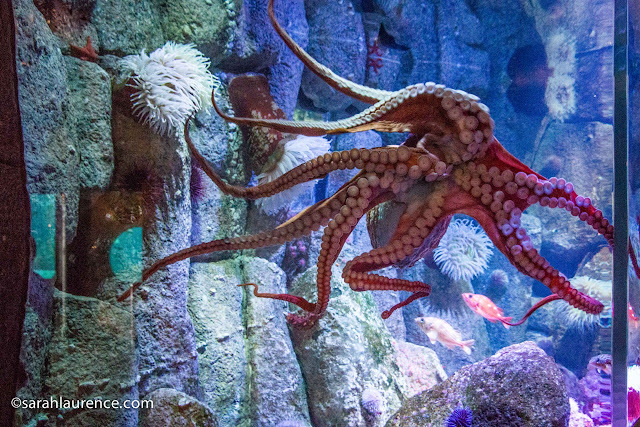 Although octopuses are naturally solitary creatures, they recognize and form strong bonds with their caretakers. At the New England Aquarium, a retired scientist makes complex toys for the octopuses to alleviate their boredom. Anna, a teenager with Asperger's Syndrome, finds reprieve from depression among her aquatic friends. The book was dedicated to her. The octopuses profiled in the narrative have individual personalities and moods too. This marvelous memoir would appeal to readers of all ages and species. Reviewer's Disclosure: In a clickhole quiz "Are You An Introvert, An Extrovert, Or A Sea Monster?" I was revealed to be a sea monster. After reading a glowing review on Beth Kephart's blog, I bought the gorgeous hardcover book at the Gulf of Maine Books. 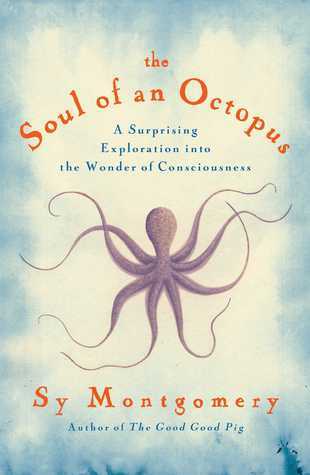 The Soul of an Octopus is the best read-in-the-tub book ever. 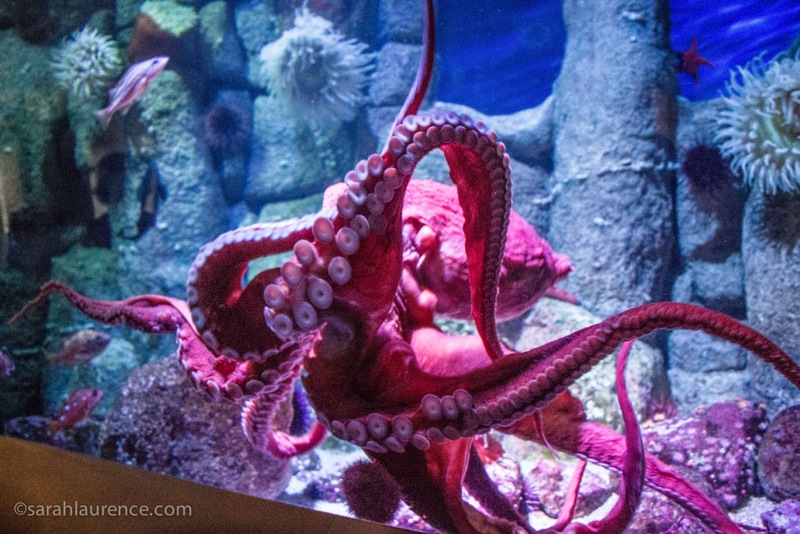 My DSLR photographs are of a Giant Pacific Octopus and fish from my visit to the Monterey Bay Aquarium in January. I was convinced that this GPO was watching me with as much interest as she danced an aquatic ballet for the awed spectators. My daughter had to drag me away at closing time. Well these creatures sound most interesting. I didn't know they have three hearts. You learn something new everyday. They are extraordinary creatures. And oops, I have been calling them octopi. This book sounds so fascinating! Who knew?? Definitely a book for Camille (that I will borrow first). Your pictures are magical, too. The books sounds really interesting, and yes, it would be handy to have six more arms. Great photos! I loved this book, too! Wonderful photos. A wonderful review! I love the photos of the real thing. I don't think I've ever seen one. I love the story behind why you picked up this book! The pictures are wonderful, but this book sounds enchanting. I "think" I would like six more arms....but it might be difficult to buy clothes! Ha! Great review. I love learning about animals. As does my child #4. Love your photos as well. Thanks for reviewing, Sarah! Great review. And I agree, it would be difficult to tear me away from looking at that stunning creature - was it really as pink as the photos suggest? No wonder your daughter had to drag you away. They are entrancing creatures. I have always liked octopuses (thanks for the clarification. I would have used "octopi".) Great review. Thanks. Amazing photos--LOOK at that color!!! I'd heard of this book but was never sure what it was about. I think we have it at our local library--I'll have to beat feet down there an take a look. As usual, an excellent review, Sarah! I loved that book, too! Tina, I didn’t know any creature had more than one heart. Stacy, Alyssa and ACiL, Beth’s review made me search for the book in the store, but the octopuses vs. octopi fact sold me on the book. 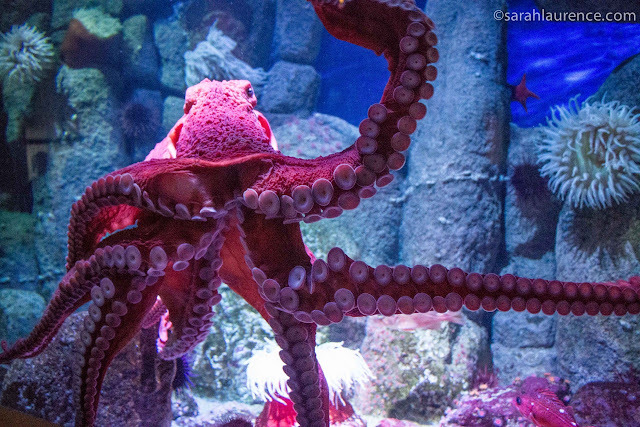 Troutbirder, the author compares octopuses to intelligent birds. Bee, Camille would love it, and I think you’d enjoy the writing too. Kristen, thanks for the extra endorsement. It did seem like your sort of book too. Amanda and Ellen, due to the low lighting (Giant Pacific octopuses are nocturnal) I had to push the photos, which resulted in the colors being a touch more vibrant, but her true color was indeed fuchsia pink, closer to the body color than the shaded arms. 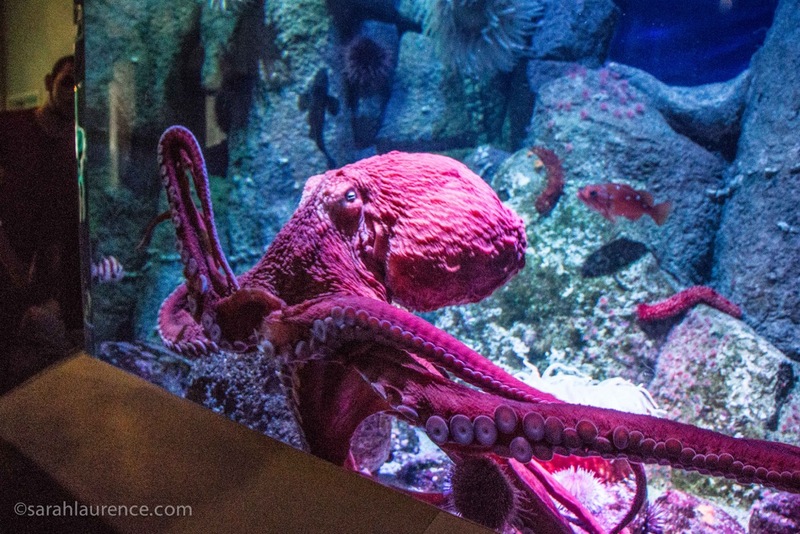 Octopuses turn bright pink when they are excited. It was quite a show! Charlotte, you know me well. I knew you’d love it too. Thanks for sharing your reaction to this fabulous book.